It would have a maximum speed exceeding Mach 3, a range of over 1300 miles, a rotary weapons unit and the most advanced radar system in the world. North American Aviation’s XF-108 was probably the most advanced interceptor of the Cold War that never was. The early 1950s saw the introduction of a variety of new aircraft into military service- the 2nd generation of fighter aircraft and the inclusion of jet-powered intercontinental strategic bomber aircraft. With the constant threat of Soviet nuclear bombers being able to push across the oceans or polar regions and launch an aerial strike came the development of interceptors, purpose-built fighters with a single mission- to prevent the enemy aircraft from being able to complete theirs. Interceptors had to be fast, somewhat rugged and armed sufficiently to deal with larger bomber aircraft and their fighter escorts. The United States Air Force set standards for its aircraft from its inception onward with the basic principle that “quantity is what you count whereas quality is what you can count on”, a concept well evident in the requirements put forth for the design of the XF-108. The LRI-X ( Long-Range Interceptor, Experimental), as the newborn program was known, called for the design and construction of a high speed, long-range area defense interceptor that could seat a pilot and a navigator/weapon systems officer (WSO), able to reach Mach 3+ with ease and punch through a ceiling of +60,000 ft. LRI-X would be able to field a conventional and nuclear weaponry in its internal bay and be able to maneuver with agility, something the airframe would belie with its large size and weight. The interceptor could, ideally, scramble at a moment’s notice, reaching and targeting incoming Soviet combers over the Arctic with ease. North American Aviation’s proposal was chosen in 1955. The entire project was to involve a number of defense contractors including Hughes Aircraft Corporation, the organization which would provide an AN/ASG-18 pulse-Doppler fire control radar, the most advanced of its kind at the time which would give the aircraft a look-down/shoot-down capability. Look-down/shoot-down allows the fighter to lock on to targets flying below the horizon determined by the radar (essentially below the aircraft) and take them out. Hughes would also provide the GAR-9 (AIM-47 Falcon), a long range high-speed air-to-air missile to be coupled with the new fire control system. The GAR-9 would be deployed from an internal rotary launcher that could also store nuclear-tipped weapons; in addition, four 20mm cannons would be built into the airframe. The pilot and his backseater would be strapped into two separate escape capsules built around their cockpits, each of them shielded against radiation. 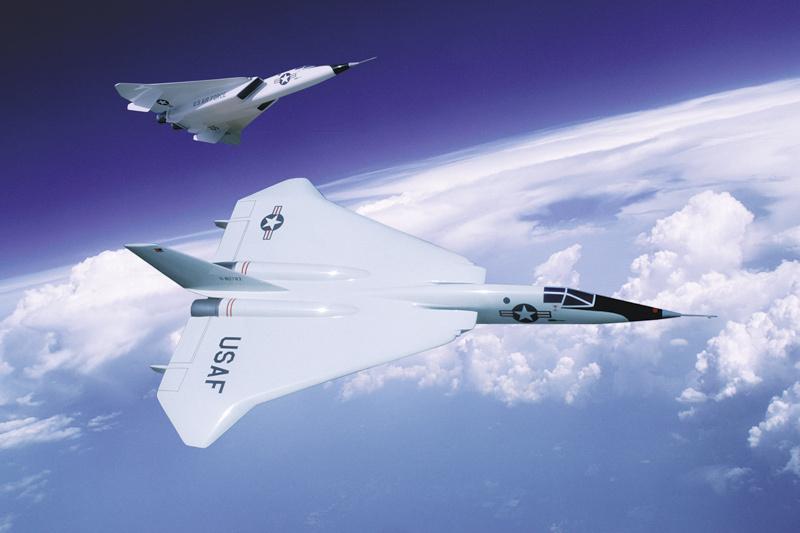 The Rapier was to be powered by two General Electric YJ93 turbojets (jointly developed for the both the XF-108 and XB-70 Valkyrie) combining for nearly 58,000 lbs of force. 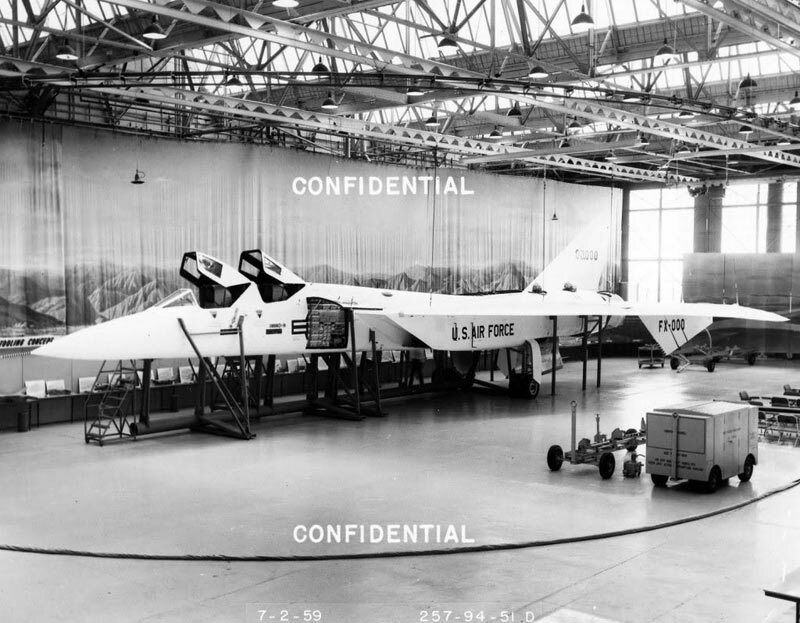 Interestingly enough, it was cancelled just a year later for political reasons prior to the reinstatement of development program as the XF-108 in 1957 which led to the creation of a mock-up. After a quick consensus among airmen of the USAF, the name “Rapier” was chosen for the sleek and sharp jet. Sadly, there was no return after the second death of the Rapier which occurred in 1959. Rising costs led the Air Force to cancel its intended procurement of 480 of the F-108, choosing to focus instead on smaller point defense interceptors like the F-106 Delta Dart, aircraft which were considerably cheaper than their larger long range interceptor brethren. At the same time, a shift in Soviet doctrine made long range interceptors enter obsolescence as the USSR decided to use ICBMs (InterContinental Ballistic Missiles) as its main strike weapon, putting strike bombers on the backburner for the time being. The F-108 never entered service or even flew for that matter, but its development wasn’t a total loss- technology and lessons learned from its design were implemented into later aircraft acquired by the USAF and US Navy (notably, the A-5 Vigilante which closely resembled the Rapier). The image used below your cover page; with the lower F-108 banking towards the viewer, is an image by Erik Simonsen. It would be appropriate if you gave credit to him. It is an image he created for his book.